About a decade ago, an eon in the ever-evolving world of climbing, a new niche of the sport was born when boulderers started visiting a relatively obscure corner of Rocky Mountain National Park, Chaos Canyon. Hidden in plain sight, the boulders there truly revealed their potential with the arrival of Dave Graham and suddenly bouldering in Colorado became important again. It has taken a while, but thanks to the efforts of Jamie Emerson, there is finally some documentation, presented in book form, of the fantastic climbing opportunities awaiting visitors. I recently went over the e-book version of his new guidebook Bouldering Rocky Mountain National Park and Mount Evans published by my friends at Sharp End and was very impressed by what I saw. It is a clear and wide-ranging guide, well illustrated and complete with extensive material about contexts such as geology and flora and fauna. High quality action photos of important problems are plentiful as well. It should be emphasized that the book is not comprehensive. The author and publishers, by agreement with land managers at Mount Evans, decided not to include anything besides Areas A and B at Evans. This means that what is likely to become the most popular and accessible alpine bouldering in the state, Lincoln Lake, is not included, along with the less popular Areas C and D and the Aerials. The newly re-discovered area of Endo Valleyin RMNP is also not here. And there are many spots and boulders in RMNP left out for environmental considerations as well. 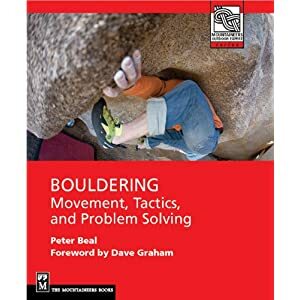 This book could be seen as partly a record of an extraordinary era in bouldering, a remembrance as much as a guide, of a time the likes of which is unlikely to occur again in Colorado. For visitors, it is an essential guide and companion to one of the most beautiful bouldering areas in the world. Looking over the book in more detail, it is very usable, tackling head-on the daunting challenge of navigating the endless talus of Upper Chaos. Detailed maps, accurate distances and elevations and many useful photographs should get first-time visitors where they want to go. Just as importantly, the book renders good advice on dealing with the specific nature of the alpine environment, its weather especially and of course altitude. It might have been a good idea to note typical patterns of cell-phone reception and also emergency numbers in case of an accident and perhaps some basic first-aid advice. Also important are the reminders to behave in this environment as responsible stewards rather than thoughtless consumers. Jamie’s work on this book has been thorough and I can’t find any serious flaws in terms of names or grades. He has done his homework and it shows throughout. The excellent essays that are found throughout the book give readers and visitors a good sense of why bouldering here is a uniquely enriching experience, how the presence of powerful natural forces makes a climbing day here much more significant than most. The long approaches, severe weather and stark terrain stand out in contrast to the tamed surroundings of many other bouldering meccas. I won’t describe the tone of the book as nostalgic but there is a sense that many of the writers have moved on, either to different areas or even different phases in their lives. The boulders still stand, for now, as witnesses to a brief period of incredibly focused and creative climbing that transformed the sport in important ways, not just locally but nationally. The sense that something special happened here is inescapable. I wonder, now that many have moved on to the much more accessible and concentrated terrain of Lincoln Lake, whether visitors may, even with the publication of this book, be able to recapture something of the peace and solitude that existed here before. Nice write up Peter, I look forward to getting my copy of this great guide and heading to Colorado to use it!